Speakers: Richard Stewart, AA Technical Liaison Engineer, and Beth Dawson, Projects Manager, Fuel Cell Systems Ltd.
Richard Stewart, AA Technical Liaison Engineer, will deliver a presentation on fuel cell operation, and Beth Dawson, Projects Manager from Fuel Cell Systems Ltd, will give a short presentation on their product. The presentation will also focus on the new Hyundai Nexo FCV and will cover, amongst other things, fuel cell operation and hydrogen system layouts. 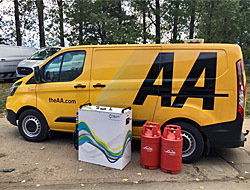 During the evening there will be a practical demonstration using the AA roadside hydrogen refuelling system, which is supplied courtesy of Fuel Cell Systems Ltd. The lecture will commence at the normal time of 19:45, but prior to this at 19:00 we will be holding the annual general meeting (AGM), which everyone is most welcome to attend. There will still be the customary opportunity to enjoy a tea or coffee and to network with friends and colleagues.